Following on from the successful initial phase of chalets in the beautiful village of Les Collons, we have just released for sale the final three chalets at our 'Haute Neige' development. All three high quality chalets are available for non-Swiss residents to buy off plan, with completion targeted for Winter 2010. Part of the 4 Valleys ski system, the village of Les Collons lies on three parallel terraces nestled between steeply sloped larch and pine forests. At an altitude of 1800 meters Les Collons is one of the highest ski resorts in this part of Switzerland and thus one of the most snow sure. The village has a multitude of amenities, with hotels, shops, restaurants and bars. Haute Neige chalets are situated very close to the centre of Les Collons and only a short distance from the ski lift station and main amenities. 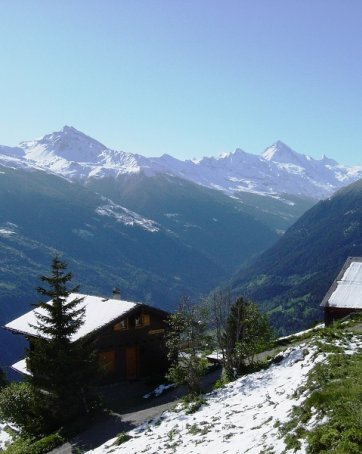 They occupy a privileged position with truly spectacular views along the Val d'Hérens. The chalets are being constructed to the highest standard with Larchwood exterior walls as standard. Beautiful natural slate roofs and popular Geothermal heating systems are also available. The interior designs and finishes can planned to suit your individual requirements. Please contact the sales team for financing options, building schedules and timescales.